However you look at it, the 2006-8 American Community Survey portrays a watershed year for the Miami-Fort Lauderdale-Palm Beach Metropolitan Statistical Area. There are now 2,099,334 Latinos in the three county metro area versus 2,072,807 Non-Hispanic Whites. Eight years ago, Non-Hispanic Whites were clearly the largest racial group with 44.1% of the metro population. However with an absolute drop in number of 133,000 since the last Census and a surge in the Hispanic population (by 395,000) has brought the two racial categories to rough parity (Latino’s can be of any race, and most categorize themselves as “White”). The story of Miami-Dade County’s transformation into a Hispanic majority county is a twenty year old story. The county was at the tipping point when the 1990 Census was taken and that tally showed that Miami-Dade was 49.2% Latino. That grew to 56.4% in the 2000 Census and the 2008 ACS shows that trend has continued and the percentage of Hispanics has now grown to 61.8%. Large increases in the Hispanic population in both Broward and Palm Beach counties have now made Latinos a plurality, if not a majority, in the three county metro area. African-Americans and Asian-Americans both have a growing presence in the metro area. Blacks now make up 19.2% of the population, up from 18.9% in 2000. The relatively small but fast growing Asian-American population increased to 2.1% from 1.7%. Please note that Fort Lauderdale and Palm Beach County will be explored in forthcoming postings. This posting is about the overall three county metro area and Miami-Dade. The Miami metro area has come to be defined by the large contingent of Cuban-Americans that have emigrated to the city of Miami and Miami-Dade County in great numbers over the last 50 years. Although Cubans make up the largest single ancestry group of all Latinos with 42.3% of the metro area’s Latino population, the constellation of other Latino groups are actually growing faster than the Cuban population. 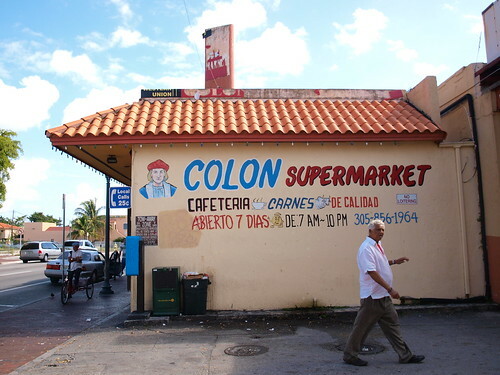 The Colon Market in the historic Cuban district of Miami. Photo by copelaes. Click to visit the original photo on Flickr. The growth of the Cuban population has been spasmodic due to the shifting nature of Cuban-American political tensions. Cuba’s upper-middle class departed en masse once Castro began confiscating their material wealth. This first wave, the Historicos, were the well-educated upper-middle to upper class Cubans that lost everything when Communism socialized their possessions. Miami was the logical destination of choice for many of these political and economic refugees. Most started with very little material wealth but an abundance of talent and ability. They first settled in the central city of Miami bringing a Latin vitality to Calle Ocho (8th Street). However, it wasn’t long before the suburban migration began in earnest. The migration to places like Coral Gables, Doral, Key Biscayne, and Miami Lakes was a natural progression for an upwardly mobile element of the Latino community. The migration of successful Cubans (and other Hispanics) to Miami’s best neighborhoods was helped along by the continuing in-migration of Cubans from a much lower socio-economic background (e.g. the Mariel Boat Lift). This may also account for the steeply rising population of affluent Latinos moving to the better neighborhoods in Broward and Palm Beach. It is not surprising that the well educated and hard-working Cuban minority was soon knocking at the door of financial success and buying into Miami’s traditional elite neighborhoods, overwhelmingly populated by Non-Hispanic Whites. No suburb was more a preserve of the traditional elite than Coral Gables. By 2008, Hispanics, mainly Cubans, have now reached numerical parity with the Non-Hispanic White population (of mainly German, Irish, English, and Italian extraction). Hispanics moved increasingly into “old money” (what passes for old money in Florida, anyway) places like Coral Gables and Pinecrest, as well as the out-sized nouveau riche waterfront mansions of Miami’s rich in places such as Coral Gables’ Cocoplum, Key Biscayne, and Miami Beach’s Star Island. Undoubtedly, every country’s immigration story is different as they provide a steady stream of newcomers to the Miami area. Puerto Ricans make up the second largest group of Latinos and they are by and large economic migrants that lack critically needed skill to prosper quickly. On the other hand, the influx of Colombians and Venezuelans most likely have a large contingent of those countries wealthy White elite. They are escaping endemic violence in Colombia and Hugo Chavez’s erratically careening march to dictatorship dressed up as Socialism. Like their Cuban compadres, I’m sure they hope to return to their native land as soon as sanity is restored. The big question is… at what point does temporary residence become permanent in the wait for things to get “better” at home? When pondering the huge increase in the number of high income households, one has to keep in mind that the American Community Survey data was collected during the years of 2006, 2007, and 2008. In other words, at the height of the real estate bubble. Florida’s economy was flying high. As is well known, Florida has been staggered by the collapse in the housing market and the latest state population estimates show an out-migration from the state. As a state that has predicated its view of itself on an endless vista of sunny growth, it has come as a rude shock. Don’t feel too bad Florida, things are worse in Nevada and Arizona! In spite of the timing of people reporting their incomes from 2006-8, the huge increase in the number of households reporting an income of more than $200,000 is staggering. The number of households in the metro area increased a mere 5.3% between 2000 and 2008, the number of +$200,000 households increased 63.8%. This is significantly lower than the growth of this category in the country (84.9%). Non-Hispanic Whites may be at parity with Hispanics when it comes to numbers, but they dominate the wealth sweepstakes. The American Community Survey showed the Miami metro area had 96,969 households with an income over $200,000 (out of a total of 2,006,818 households). Non-Hispanic Whites had 69,380 of these incomes or 71.5% of the total. Latinos had 21,599 of these high income households or 22.3%. The growth in this high income sector shows Latinos gaining on Non-Hispanic Whites . The number of Latino households earning over $200,000 between 2000 and 2008 grew by101.9%, double the percentage increase by Non-Hispanic Whites (50.6%). African-Americans make up a very small portion of high income households with only 3,146 households reporting an income over $200,000. Blacks make up 19.2% of the three county Metro area’s population and yet only 3.2% of the households with incomes over $200,000. Asian-Americans make up a mere 2.1% of the Miami metro’s population and 2.3% of the high income households. Due to the paucity of affluent Black and Asian-American households, the rest of this essay will concentrate on Non-Hispanic White and Latino households. When one examines the three counties and cities with over 20,000 people, there are some interesting patterns in the growth of wealthy households between 2000 and 2008. Table Three shows that the number of households earning over $200,000 are fairly evenly split between Miami-Dade, Broward, and Palm Beach Counties. Broward showed an extraordinary growth in high income households (+85.8%) and Palm Beach lagging at a growth rate of 45.1%. Palm Beach County’s growth may lag a bit but it is still the wealthiest of the three counties in terms of median household income and it also continues to have the highest proportion of wealthy households. Table three lists all of the cities in the metro area with over 1,000 households earning more than $200,000. Note that two of the metro areas wealthiest suburbs (Palm Beach and Pinecrest) are not enumerated for 2008, as they don’t have the requisite 20,000 population to be broken out separately in the American Community Survey. 1 2000 Census figures for recently incorporated Palmetto Bay are a composite for the previous CDP’s (unincorporated places) of Cutler and East Perrine. Every major city in the metro area showed a much larger growth in wealthy households than total households. Whereas the metro’s number of households grew by 5.3% between 200o and 2008, the number of wealthy households earning over $200,000 grew by 63.8%. 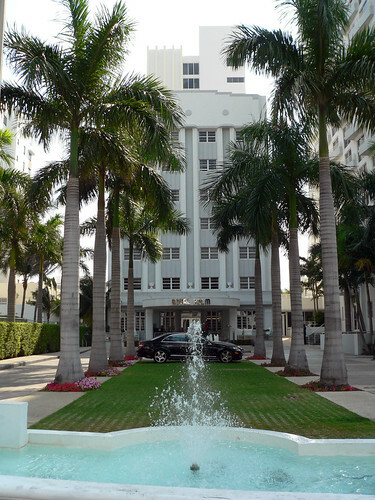 An art deco hotel in Miami Beach. Photo by Stig Nygaard. Click to visit the original at Flickr. As most Miamians know Miami Beach’s resurgence is very noticeable. Although the number of households actually declined by 10.3%, the number of high income households increased by 78.7%. The building boom that has so altered Miami Beach’s architecture has also altered it’s socio-economic make up. The ACS found the number of Non-Hispanic White +$200,000 households increased to 2,298 of Miami Beach’s households, an increase of 64.3%. Meanwhile, Latinos saw a 91.0% increase to 785 households making that sum or more. Miramar, a fast growing southern Broward County suburb showed the highest percentage increase of high income families (+336.9%). Miramar has a significant African-American population as well as large contingents of rapidly increasing Latinos and decreasing Non-Hispanic Whites. The number of Hispanic households earning more than $200,000 increased an astonishing 424.8%. Table 4 shows the vast increases by Latinos earning high income by county and place with over 20,000 people. The physical of geography of Miami metro’s three counties’ highest income neighborhoods is difficult to capture by the Census Bureau’s system of tracts and block groups. For the most part, waterfront property and it’s many gradations of status reign supreme in determining the value of housing. At the top of the hierarchy are two types of lots that have their charms depending on your personal taste. Atlantic Ocean lots are scarce and extremely expensive. Most are so valuable that they are monopolized by high rises. Equally desirable are intra-coastal lots that have the added advantage of allowing for a place to moor your yacht. Palm Island in Miami. Photo by Patrick Swint. Click to see the original at Flickr. The endless miles of canals and faux lakes that have been excavated to create more waterfront seems to be valued by how far it is away from the oceanfront. Naturally, the further from the ocean, the lower the value. The end result is an extremely linear geographic pattern of wealth with houses on water costing two to three times as much as there landlocked neighbors. All three counties have a series of spectacularly wealthy small communities on the barrier islands that face the Atlantic. Starting with Key Biscayne in the south and working it’s way to the grand daddy of them all, Palm Beach. Further complications to accurately capturing wealth in the Miami metro area are the high number of seasonal homes. Income is counted at a household’s “first home”, and therefore many of the beautiful homes in the Miami area are not counted for income purposes. Yet another complication is the large number of retirees: even wealthy retirees have lower incomes than people in their working prime. Finally, there is the mixed use of the highly desirable waterfront locations: endless high-rises dot the waterfront and they inevitably bring mean household income down whether they are rentals or condominiums. The Brickell Avenue corridor has witnessed a boom in high rise construction (until recently) and it is not represented in the Higley 1000 despite a large array of very expensive condos. There are two main areas of Higley1000 neighborhoods in Miami-Dade, the Coral Gables-Pinecrest nexus and the luxury housing found on Miami Beach. Coral Gable’s expensive neighborhoods range from the traditional villages built when the city was first developed by George Merrick in the 1920s Florida land boom, to more recent gated communities along the Biscayne Bay waterfront. Merrick’s planned suburb included the grand Coral Gables Biltmore Hotel as well as the University of Miami. The original 1920s homes featured the eclectic architectural style that was popular at that time. They were available in various “villages”. Three of these older neighborhoods from the Twenties that are ranked in the Higley 1000 have significant Latino populations. These neighborhoods are #477, Southern Colonial Village (43.4% Hispanic in 2000); #486, Dutch South African Village (30.6% Hispanic); and a neighborhood that came in at #683 and that I have dubbed Granada Golf Course West (47.9% Hispanic). The large Block Group that runs along Biscayne Bay is home to Coral Gables’ nouveau riche McMansions. The neighborhood that I have dubbed Cocoplum-Gables Estates is actually made up of a dozen gated developments along the waterfront. These gated communities rank a lofty 64th on the Higley 1000 and are 42.9% Latino. Pinecrest, is a newly incorporated suburb. Following a successful campaign by Key Biscayne for incorporation, many of the more affluent areas of Miami-Dade County quickly followed suit. In the course of a few years, Pinecrest, Doral, Miami Lakes, Palmetto Bay and even downscale Miami Gardens made successful bids for incorporation. Pinecrest, often referred to as “Old Cutler” before incorporation has some of the wealthiest neighborhoods in the Miami area. I have named the Higley 1000 neighborhoods in Pinecrest for the largest subdivision names in each Block Group. The Pinecrest neighborhoods also have a significant number of Latino households: #25, Rockdale Estates-Cutler Bay Estates (38.5% Latino); #44, Devonwood-Bayridge Estates (16.9%); # 490, Mitchell Manors-Collins Heights (31.9%), and, #585, Rollingwood Estates-Town and Country Estates (15.9%). Coconut Grove (#348), Miami’s premiere central city neighborhood of wealth had a surprisingly low 9.8% of its households categorized as Latino in the 2000 Census. The glitzy transformation of Miami Beach’s South Beach neighborhood over the last 20 years has been stunning. However Miami Beach has always featured a wide array of wealthy single family island neighborhoods far away figuratively, if not physically from the pulsating Ocean Drive. The wealthiest of these island neighborhoods is Fisher Island (#18 in the Higley1000). It’s is relatively “new” in that it has built out over the last 20 years on an island that was originally owned by the Vanderbilts. The Fisher Island Club is located in the renovated Vanderbilt mansion. It is located at the southern tip of Miami Beach and is accessible solely by ferry or private boat. It is extremely luxurious and primarily made up of condominiums… a rarity for such a lofty ranking in the Higley 1000. Other exclusive island neighborhoods in Miami Beach include the celebrity laden Star Island as well as Hibiscus Island, Palm Island, the Sunset Isles, and La Gorce. Indian Creek Village is a ultra-exclusive island (and a tiny incorporated place) in Biscayne Bay. It consists of 35 mansions surrounding a golf course. Due to it’s tiny size and the fact that most of the homes are second homes, it does not make the Higley 1000.